You may need a Planning Permit, a Building Permit or both to build a pergola on your property. Is the structure a pergola? 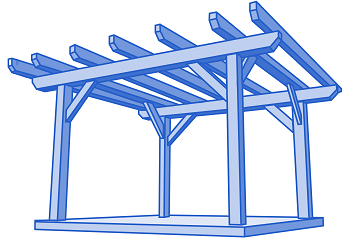 To be a pergola, the structure you are building must have no roof. A pergola may have a covering of open-weave permeable material which allows water to pass through, such as shade cloth. To help you work out which permits you need, begin at Step 1 and answer the questions one at a time. You may be asked to measure the area or width of the pergola, or refer to the site plan to see the position of the pergola relative to the building. Check for easements on your property. When an easement is obstructed, it can prevent important maintenance work and block the flow of stormwater. If your plans impact an easement, it may be necessary to modify your plans. Are you building a pergola in a Heritage Overlay? If no, check if other overlays affect the works. If yes, contact Heritage Victoria and apply for their approval. Then check if other overlays affect the works. Note that additional overlays may appear. We may refer to the overlay listing at a later stage. Are you building a pergola in an Environmental Significance, Special Building, Land Subject to Inundation or Public Acquisition overlay? Refer to the report from Planning Maps Online and see whether your zone is listed as either ‘Commercial’ or ‘Public Park’. Are you planning to construct a pergola in a non-residential zone? Refer to the report from Planning Maps Online and see whether your zone is listed as either ‘General Residential’ or ‘Neighbourhood Residential’. Are you planning to construct a pergola in a General Residential or Neighbourhood Residential Zone? If no, look at planning requirements for a Mixed Use or Residential Growth Zone. Refer to the Certificate of Title (available from the Landata website) and calculate the area using the title boundary dimensions. Is your lot less than 500 square metres? If no, review additional overlays that may affect your property. 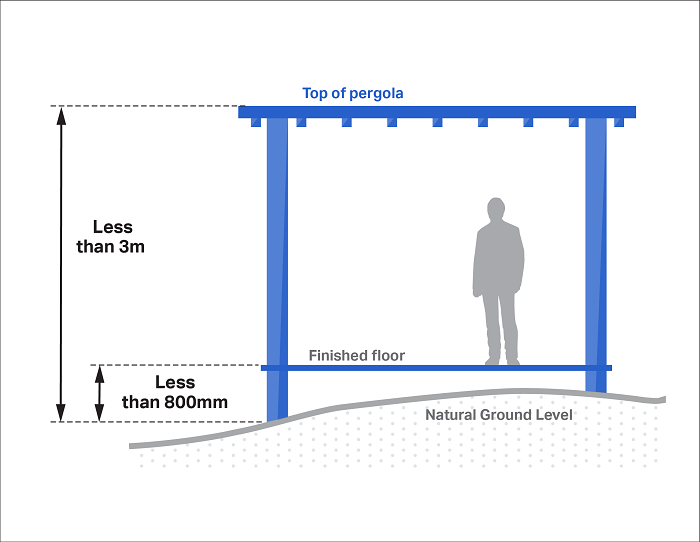 Measure the distance between the highest point of the pergola structure and natural ground level. See whether the height is under 3m. Next, measure the distance from the finished floor of the pergola to natural ground level. See whether the distance is less than 800mm. Is the height less than 3m and the distance from floor to natural ground level under 800mm? If yes, review additional overlays that may affect your works. As the owner of a property in a Mixed Use or Residential Growth Zone, you need to check whether the lot is less than 300 square metres. Is the lot in a Mixed Use or Residential Growth Zone less than 300 square metres? Refer to the report from Planning Maps Online and check whether a Development Plan Overlay affects the works. Are you building a pergola in a Development Plan Overlay? If yes, contact Statutory Planning for access to the relevant development plan - email Statutory Planning or call 9278 4888. Follow the planning officer's amendment advice. When advised, go to the next step. Refer to the report from Planning Maps Online and check whether a Significant Landscape Overlay appears. If a Significant Landscape Overlay appears on the report, assess whether the height of the pergola is more than 6m. To do this, measure the distance from the top of the structure to natural ground level. Are you planning to construct a pergola over 6m high in a Significant Landscape Overlay? Refer to the report from Planning Maps Online and check whether you are planning to build a pergola in a Design and Development Overlay. You don’t need a Planning Permit. You do need a Planning Permit. Are your works affected by a Design and Development Overlay that requires a Planning Permit? If no (and you are not affected by any other planning restrictions), you do not need a Planning Permit. See if you need to apply for a Building Permit. Obtain a clear copy of your Certificate of Title, including the lot plan. You can get this from the Landata website. The Certificate of Title must be no more than 28 days' old. Write a neighbourhood and site description. See whether your application is eligible to be fast-tracked under VicSmart. For fee information, email Statutory Planning. Measure the length and width of the pergola to calculate the total area. 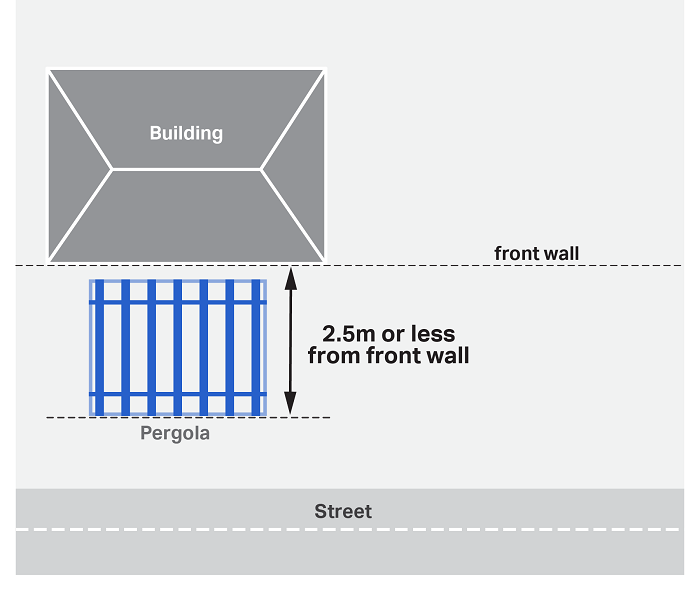 Is the area of the pergola more than 20 square metres? Measure the distance from the top of the structure to natural ground level. Is the height more than 3.6m? 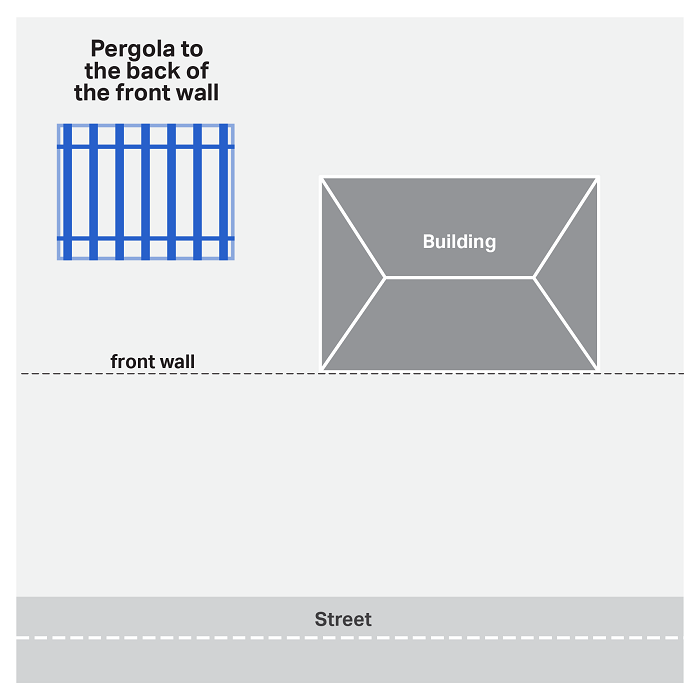 Measure the distance between the front of the pergola and the front wall of the building. Is the distance you measured 2.5m or less? If yes, you do not need a Building Permit. As long as there are no planning restrictions, you can proceed to construct the pergola. If no, apply for a Building Permit. Read the Building Permit application checklist to determine which supporting documents you need for your circumstances. If you are unsure what you need, contact the Building Services team on 9278 4999 or email Building Services. Complete the Application for a Building Permit. Lodge the Building Permit application form, fee and supporting documents with the City of Boroondara. For fee information, email Building Services. You can only begin your construction after the Building Permit is granted. You may exit the guide. Statutory Planning aims to respond to Planning Permit applications within 60 days, as governed by the Planning and Environment Act 1987. A Building Permit application is assessed within 10 business days. The response is usually a request for further information that is required before a Building Permit can be issued.